The solar industry is booming. The millionth set of solar panels in the United States was installed sometime in the last two months, and industry leaders expect the number of solar-powered systems to double within two years. Just 30,000 residential solar installations dotted the country a decade ago. 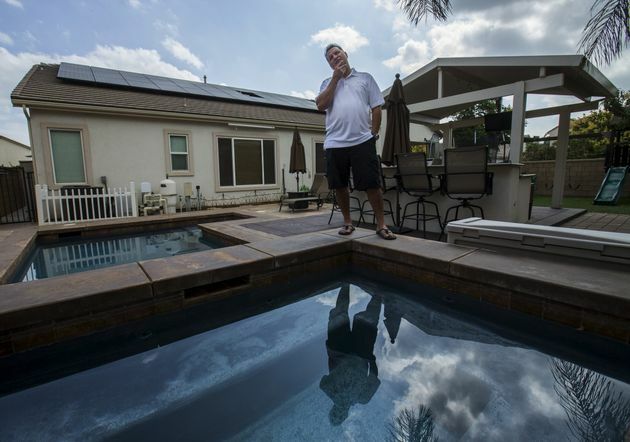 Since then, the cost of generating power from solar has dropped by over 70 percent. Falling production costs, combined with improvements in electricity storage and a decline in the number of coal-fired power plants, has fueled the industry’s breakneck growth, according to Rhone Resch, president and CEO of the Solar Energy Industries Association. Most of the solar installations added over the last decade have been residential units like this one. The million-installation mark is just the latest milestone reached by the solar industry in recent months. In 2015, for the first time ever, the U.S. added more new energy capacity from solar than from natural gas. And in December, 2015, Congress extended the Solar Investment Tax Credit, which provides generous tax incentives for homeowners and businesses that install solar panels. The industry’s rapid growth shows no signs of slowing. “It’s entirely possible that over next five years solar could be single largest new source of electricity in the country,” Shayle Kann, senior vice president of research at GreenTech Media, told reporters. That’s good news for the climate. The energy industry in the U.S. spews more climate-warming greenhouse gases into the atmosphere than any other sector, due to its reliance on fossil fuels. Carbon-free energy sources like solar promise to cut the country’s greenhouse gas emissions and help the U.S. meet carbon reduction goals outlined in the Paris climate deal, which aims to keep planetary warming under 2 degrees Celsius above pre-industrial levels. But the solar boom isn’t just helping to wean the country off fossil fuels. It could also change the way Americans consume electricity. Unlike traditional power sources, producing electricity from solar doesn’t require people to hook up to a centralized power grid. They can slap panels on their roof and generate power at home. At-home power production could supplement energy from the grid and help people weather blackouts, according to Resch. While most solar-generated electricity in the U.S. comes from large industrial sources, around 900,000 of the country’s million solar installations are small-scale, residential systems, Resch said. The expansion of home systems represents a major shift in how energy is generated and distributed in the U.S., according to Adam Browning, executive director of the nonprofit Vote Solar. 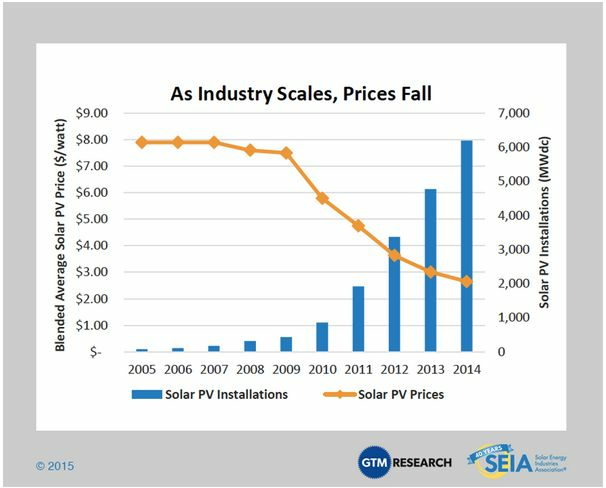 As prices have fallen, solar capacity has grown dramatically in the U.S. Solar is taking off just as the coal industry is tanking. In 2015, coal’s share of energy production in the U.S. dipped below 40 percent for the first time in 30 years. Several major coal producers have filed for bankruptcy in recent months, and dozens of coal plants have shuttered, most recently on Wednesday, when Illinois announced it would close three coal-fired plants in the state. While the decline of coal means fewer jobs in the industry, solar advocates hope the rapid shift towards solar and other renewable industries will make up for job losses in the fossil fuel sector.